What did you like most about this workshop? Wealth of info - presented in an entertaining manner. The music in the beginning and it was nice when Kordell went around and greeted everyone before the session began. Great - entertaining & informative. Excellent speaker; he was energetic, entertaining, educational and left us with a memorable experience. Fun - great way to start the day. He kept our attention & put real life experiences into one stops. Humor with a purpose - Great!! Very intertaining with comedy but with truthful knowledge!! Loved it! Very interesting & ? Experience…Loved handout. What did you like most about this workshop? (cont'd) Reminder of our focus. The whole thing - got his message across in a humorous way. Opening. Great eye opener. Very creative and audience interaction outstanding, great event, exceeded expectations, wonderful experience. Great workshop - Kordell was great. Very fun - very upbeat. Humor with the subject of the workshop. Superb speaker - excellent application of service content to ? The speaker was wonderful. 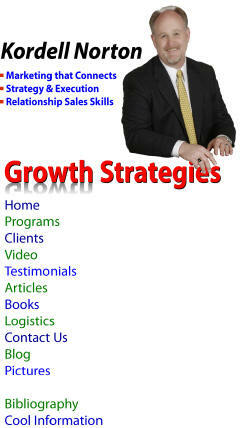 He is very knowledgeable and has lot of good information. It was "real", he brought light to our perspectives of our brand recognition. The audience participation and inter-action. Very interesting presentation. A fantastic presentation & presenter. What suggestions do you have for improving this workshops? Make it longer - only an hour. NA (except maybe more than 1 hour). I wish it was longer, because it would have been helpful to hear his marketing strategies. None, except make it longer. Give more time - full-day to develop a plan. Add powerpoint w/easel…for greater visibility. More time on the handout. What suggestions do you have for improving this workshops? (cont'd) More time. More time needed in a workshop like this. There was not enough time to top the resources fo this wonderful speaker. Longer time from one hour-two hours. What topics would you like to see in the future workshops? Do again w/longer time. Additional Comments Fatastic! Repeat & encore! Thank you! What a way to start a day! Would be a great keynote speaker next year. This was a really good workshop that offered a lot of useful and helpful information. This was an inspirational workshop - mad you think about ways to improve/market - one stop & it's services. I enjoyed this workshop very much. I would attend additional workshops w/Kordell Norton. Would like to review upcoming workshops - email: purvik@odjfs.state.oh.us. Very energetic, easy to understand - enjoyed it. Prefer table to write on uncomfortable writing on lap. Best presentation yet in this conference!!! Great speaker. Have him back next year.